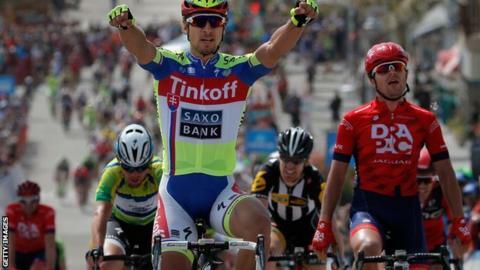 Peter Sagan outsprinted Mark Cavendish to win the fourth stage of the Tour of California in Avila Beach and close the gap on overall leader Toms Skujins. Slovakian Sagan, who finished second on the opening three stages, is 22 seconds behind Skujins after earning 10 bonus seconds for winning the leg. Cavendish finished third behind Wouter Wippert after a late Daniel Oss attack scuppered the sprinter's lead-out. The Manxman retains the points jersey, on 40, by a single point over Sagan. Cavendish looked to be well positioned heading into the final six kilometres, with six Etixx - Quick-Step team-mates ahead of him. But Oss's burst of speed in the final kilometre, coupled with a number of tricky corners, caused confusion and Cavendish was several riders behind Sagan coming off the final turn. The Tinkoff-Saxo rider, who earlier this season was accused of having "lost something" by team owner Oleg Tinkov, said: "I'm very happy. "Cavendish was behind me, maybe I did some turns better, and from the last corner I just sprinted." Thursday's fifth stage is a 154km race from Santa Barbara to Santa Clarita. The route features four climbs but a flat finish, which could favour another bunch sprint.